Parents came to last week’s Board of Education meeting looking for help from volunteers and the school district. Parent Megan Griffault referred to a particular incident at the middle school Rec Hall, a monthly Haddonfield Middle School social event for students in grades six to eight. During a recent Rec Hall, students got rowdy while music was playing, causing the DJ to stop the music and volunteers present attempting to calm down the students, school officials said. This sparked a broader conversation about the need for more parent volunteers at school activities, especially at the middle school, as well as a possible look at what more, if anything, the district can do to help. Perry said the district would investigate a policy that would be voluntary and could be promoted by student peer leaders and the community. He stressed that the district would not be pursuing a mandatory 24/7 policy as it had in the past. The former policy, which allowed the school district to ban students from participating in extra-curricular activities due to incidents that happened outside school, was discontinued, and a global settlement was resolved in April 2014 regarding pending litigation in state, federal and administrative courts. “Interestingly, the idea of an ‘opt-in’ 24/7 policy was one of the discussion points raised by the attorney for the families that challenged the (previous) policy,” Joseph Betley, the board of education’s solicitor, said in a follow-up interview. The 2015–2016 Haddonfield Middle School PTA President Cynthia Gaffney said at last week’s board meeting that there needed to be better discussion with all of the parents in the community on parental involvement in activities. She said they have trouble finding volunteers for many activities, but specifically Rec Hall. She said this past year, a Rec Hall in April was cancelled due to not having enough volunteers, and that was a very unpopular decision. So when May came around, again they didn’t have quite enough volunteers, but held the Rec Hall anyway. Gaffney said the May Rec Hall showed the appropriate number of chaperones needed for the Rec Hall to run safely. She said as of now, the plan is to send email reminders if there are not enough chaperones and, if there aren’t, even the night of the event, the Rec Hall will be cancelled. Perry said there are a lot of benefits to Rec Hall, socially and culturally. Gaffney agreed. “I went to two Rec Halls this year and saw how much fun the kids are having. It really means a lot to them … There are a lot of positive things that happen with it,” Perry said. “There are a lot of diverse activities offered so every child has an opportunity to socialize and feel they fit in and get along,” Gaffney said. The board agreed it would look into possibilities such as policies, having printed permission slips with the policies for parents and students to read, and having more teacher or administrative chaperones. For next year, the sixth-grade Rec Halls are already being separated from the seventh- and eighth-grade Rec Halls. The PTA needs parent volunteers. For those interested in getting involved, visit the HPS website www.haddonfield.k12.nj.us, go to the individual school and click the PTA tab for meeting dates and contacts. • Parent Jen Leonard also asked the board to look into a way to help students who are already in the school system stay at their schools if a move within the district is made. Leonard said she didn’t know if she moved to another part of the district that her children would be placed in another school, and when speaking to others they, too, did not know of this. She felt if she had known that moving within the district would make her child have to go to another school, she might not have moved. Perry said that fifth graders are grandfathered in. For those younger than that, he would look at what can be done, but if he does something for one or two parents, he feels he would have to do it for all parents. • For the open seat left by previous board member Drew Hansen, the board received three applicants. A decision was made for previous board member Maureen Eyles to serve the remainder of the year. 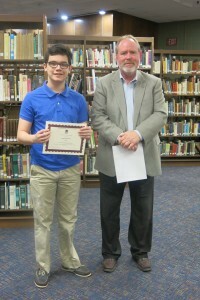 • Eighth grader Sam Beatty received a certificate for placing first in the Haddonfield Middle School Geographic Bee in February and qualifying for state finals. • The board and administration spoke kindly on retirees Nancy Motolese, Christopher Gwin and Stephen Uibel. • The next meeting, as well as the board retreat, is planned for July 21, tentatively at the Central/Middle School Library.